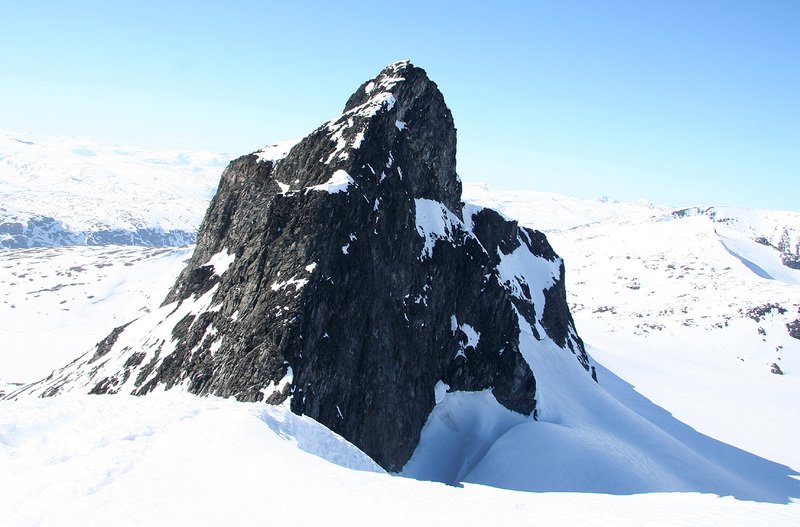 Route description: First, read my description of Storebjørn. 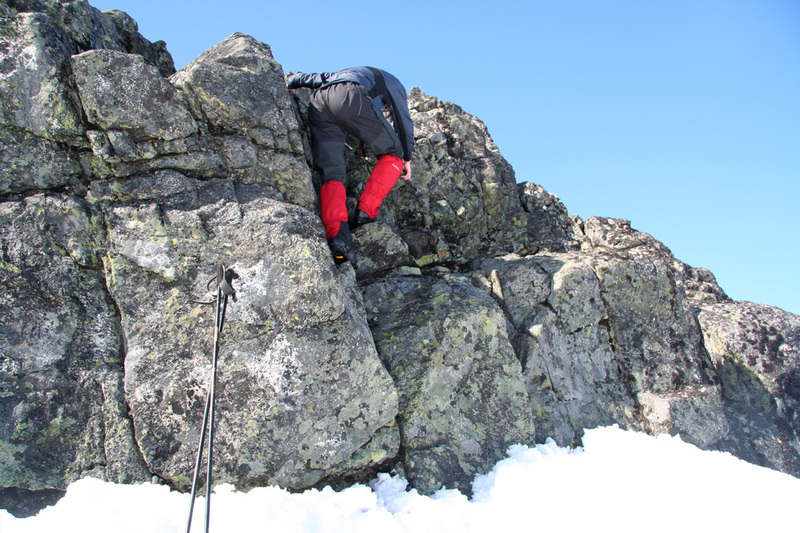 From the saddle between Kniven and the insignificant point 2077, proceed up the broad ridge towards the summit. After only about 30 meter, there is a 3 meter high band of cliffs. This is the crux of the route. There are many good holds and the climb is a somewhat hard (YDS) class 3. Above this step, one just continues uphill, slightly left in order to reach the highest point. From Store Smørstabbtinden, I skied back more or less the same way as I had skied from Saksi (on the east side), then gained the col between point 2077 and Kniven, good and easy skiing all the way up. I gained the summit around 1630, the day was nearing its end and I felt the effort of climbing all five peaks in this area with prominence of 100 meter or more in a single day. This was the fifth and final peak climbed on this near perfect day. I set course directly back to the upper part of Bøverbreen. This glacier has crevasses in the middle, but at this time of year, looks pretty good near the northern edge. I had ascended pretty much the same way early this morning. What I only knew about half an hour later, was that I must have skied less than 50 meter from a man that just a few minutes earlier had fallen into a crevasse and now was hanging up-side-down inside the crevasse, but 15 meter above its bottom. The man (52 years old) hang from what fortunately were sturdy skis, bindings and boots. His younger partner arrived at Sognefjellshytta just minutes ahead of me. He had then received an SMS message from the desperate man, telling that he was up-side-down above the abyss. A snow scooter with rescue gear was quickly sent to the area, nobody knew exactly where the man was. Furthermore, a rescue helicopter was called from Lillehammer. The helicopter arrived fairly soon, but it took time to locate the place of the accident. There was of course great concern for the life of the victim and the rescue service decided to call in more manpower. A Sea-King helicopter with more personel was reported to be on its way. This would need to land at the Sognefjellshytta. It would ideally require about 30 meter of free space, meaning that all the cars in front of the hut would have to be moved. The Highway (no 55) would also have to be closed. I took on the task to locate the owners of the cars, most were found around inside the hut, a few were located via giving the license plate numbers to the police (via cell phone). We could then call the owners. One small car was lifted (by about 8 men) out of the way. Just then, the good news came that the man had been rescued and was alive. The Sea-King could be called off. The man hang 3 hours up-side-down from his boots. The rescue crew said they had never seen anything quite that dramatic before. I finally left around 1930, realizing that I better find a place to stay and a dinner before it got any later. My plan to drive at least to Lom got changed and I stopped at the well known place Elveseter and asked about room/dinner. This was all possible and the day ended with a good dinner followed by a good night of sleep. 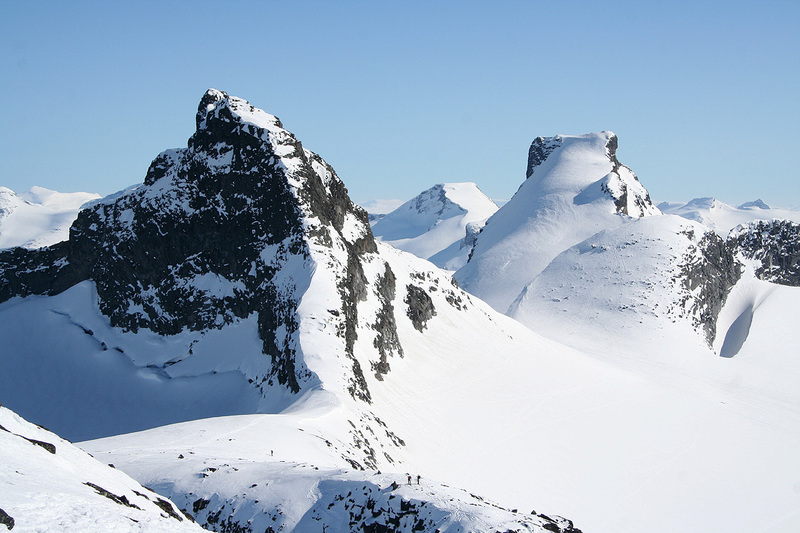 My trip continued the next morning with an attempt to ski to Nordre Hestbrepiggen. The crux, a short, but rather steep (YDS) class 3 climbing section. 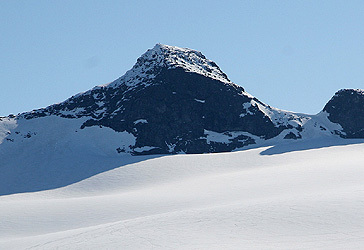 Summit view, Saksi (2189m) and Storebjørn (2222m). 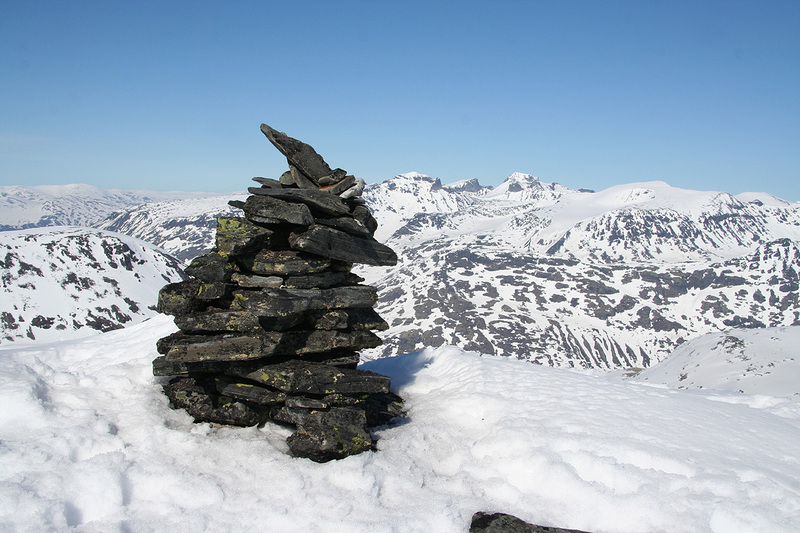 Store Smørstabbtinden, as seen from the summit of Kniven. Scene of the accident, the helicopter is near the place where a skier fell into a crevasse and ended up hanging up side down from one of his skis. My ski tracks (both up and down) can be seen a bit further to the left. 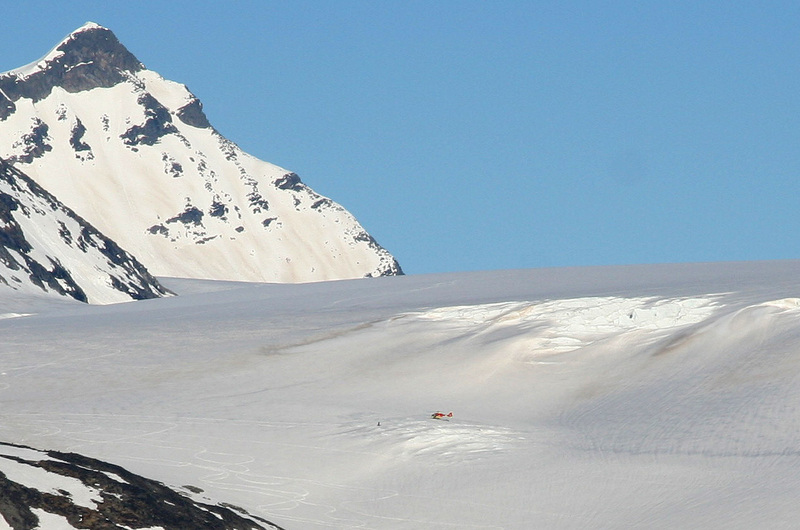 One can see that the glacier may be less safe in the area near the helicopter.